This playlist has 8 short homeschool videos in it. There is a menu on the top left corner of the video screen that allows you to see the entire playlist and skip ahead if you would like. 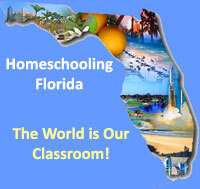 The videos explain how to get started homeschooling, how to keep a portfolio, the simplicity of a homeschool evaluation, how to withdraw your child from a public school, FLVS, and how to homeschool high school.